Visiting Thailand and want to make the most of your trip? Live here and want to get inspired for your next adventure? We have dozens of guides taking you in and around the Land of Smiles, from the rugged mountains of the north, to the postcard-perfect tropical islands of the south. Explore the interactive map below for our take on some of Thailand's most popular destinations. You can also check out our Bucket List series, where we profile some of the top activities and things-to-do from around the country. 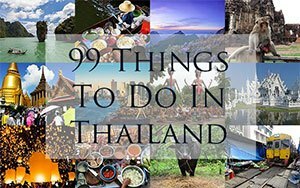 If that's not enough, head on over to our comprehensive guide: 99 Things To Do in Thailand Before You Die! Whether you are visiting the melting pot of Bangkok, the beautiful islands of the South, or the mountains of the northern border... Thailand is full of activities that can create memories for a lifetime. Our Bucket List series highlights some of the most popular excursions for tourists, expats and locals alike. If you are planning a holiday, a weekend away, or simply a new adventure in your adopted home, we hope the list below will give you some inspiration and ideas. What's on your Thailand bucket list?